At DNUG Herbert Wagger from INTRANET Software & Consulting GmbH and Hansjörg Jerabek from the university Heidelberg presented XProject, a social and analytical project management system. With this application they won the DNUG Collaboration Award 2013. The application has been implemented using XPages and comes with a nice user interface for tablets. The screenshot shows the home page of a project with links to todos, activities, etc. The project members are displayed in the upper right corner. The sizes of the circles with the pictures depend on the contributions of the members in the particular project. 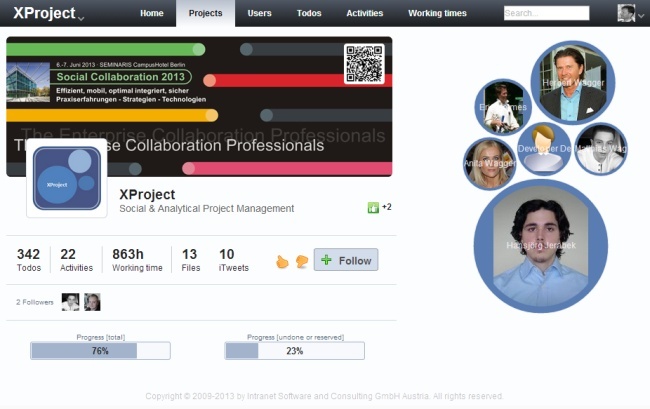 “XProject – a solution of INTRANET Software & Consulting GmbH – is a new project management platform, utilizing social collaboration and social business functionality to improve productivity in projects. The solution was developed based on IBM Collaboration Solutions (ICS) using XPages. XProject is integrated into the existing social business solution ‘safebook’ (Social Apps For Enterprises). 1. A project can be considered as social stream (timeline), which is designed and processed according to the ‘Followers’ principle. 2. The project team is presented with a social graph relationships and influences (bubble chart, interactome graph, etc. ), as well as interfaces mapping to external specialists. 3. The project knowledge is made available by using i-Tweet (status updates) and tagging principles, constantly updated in the timeline in real time – can be liked, commented and discussed. Thus can react in real time to important changes. 4. The networking of (regionally) distributed team is supported by the platform (chat rooms, forums, wikis, etc.). Thus, the regional boundaries are broken and there is no necessity of communication via email, phone or other channels to share information with other teams. 5. The integration of expert profiles (e.g. from Safebook analysis) are presented and proposed for networking (following). 6. The project timeline is processed by tagging as an active calendar with advanced features (zooming timeline). 7. Different roles in the social graph allow a differentiated view on project management (project manager’s view, team member, ‘Me’, daily/weekly recap, etc. ).